Modern cover stocks can create an enormous amount of friction when they come in contact with dry lane. When you loft the ball onto the lane, it lands with a tremendous amount of force (ever drop one on your toe?) The weight of the ball plus the inertia from its speed drives the ball into the lane surface, crashing right through and displacing whatever oil is present, creating an oil divot in the process. Oil divots? Sure, walk up to the foul line and look at them. 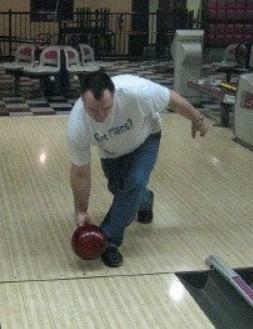 As avid bowlers, we spend a lot of time working on our games and studying the best ways to throw the ball. 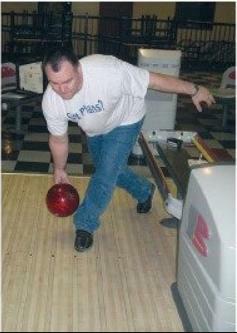 A properly thrown bowling ball has several kinds of energy imparted into it by the bowler. Among them are kinetic energy (speed), rotational energy (revs), and axis rotational energy (direction of spin). The last thing we want to do is to send part of that energy we have worked so hard to produce into the lane surface instead of down the lane where the pins are. When we release the ball on the upswing, the ball goes flying into the air and lands on the lane like a cannon ball. That would be great if our goal was to drive nails into the lane, but that would be a totally different sport. When a lofted ball impacts the lane, it slows the ball’s speed and scrubs off some of its rev rate. When the ball actually bounces on the lane, it takes a double hit. Since you are going to get a different result from the impact with the lane each shot, you are also going to get a different ball reaction down the lane. If we release the ball close to the lane and on a flat plane parallel to the lane surface, there will be no crash into the lane. A smoother landing sends most of the ball’s energy down the lane, not into the lane. This type of release also tends to lessen under/over ball reactions on flatter oil patterns. If you think about the natural shape of an arm swing, it is very round. If you buy into the fact that the ball should be delivered on a flat plane and not “hit up” on and lofted into the air, you can see that would be a very difficult thing to do if your swing is rounded at the bottom. Your window of opportunity to release the ball on a flat plane is very narrow. If you can create a nice long flat spot at the bottom of the swing, that small window grows to a giant picture window. Think of your arm swing as a big semicircle starting at the top of your back swing and ending at the release point. Now imagine that semicircle with a short, flat spot on the bottom that runs parallel to the approach for a few inches. Kind of like a flat tire on your car. In the photos you can see a white line and a black line. The white line shows the natural path of your arm swing if you don’t create a flat spot at the bottom. If your ball follows the path of the white line, you may have the previously mentioned problems. 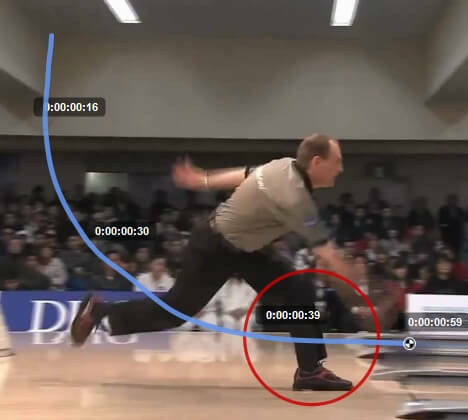 If you make your ball follow the path of the black line your ball will land on the lane smoothly resulting in a more predictable ball reaction. One key to obtaining this flat spot in your swing is to make yourself follow-through along the black line in the pictures toward the pins instead of up toward the ceiling as we have been instructed to do for years. This does not mean to cut your follow-through off abruptly but just don’t jerk up with it as the ball leaves the hand. Having a nice long flat spot at the bottom of the swing has the same effect as that smoother landing release mentioned above; it also reduces under/over ball reactions on flatter oil patterns. Even if you blow the release timing a little, the ball is still released on a flat plane. If you have a rounded swing shape, the elevation trajectory is consistently changing and on flatter oil patterns small things can make big differences. #Step 1: The first step is to get in a good finishing position and simply set the ball on the floor close to your slide ankle like in the photo labeled as A. Then bend your slide knee, bend at the waist a little, drop your shoulder, and put your hand in the ball. Don’t pick the ball up off the floor right away. I want you to pause for a second and notice exactly how far down there the floor actually is and how close the ball is to your ankle. Also note the position your body must be in for all of this to happen. If you have a lot of miles on your body’s odometer and you are not as limber as you once were, feel free to stand up and take a break when you’re stressed. The good news is that standing still and doing this exercise is far more difficult than actually performing the scoot while in motion. If you have a pretty tight thumb hole you may need to take one or two pieces of tape out so the ball will come off your thumb at the very slow speed you’ll be producing. Secondly, when you pick the ball up and start to swing it a little, try to keep your wrist straight and your hand behind the ball. If you allow your wrist to bend back, your hand will be on top of the ball. If your wrist is not strong enough, consider using a wrist brace. The idea is to land the ball on the lane so smoothly that if you did it perfectly you would not even hear it hit the floor. Not many people actually get to that point, but that’s our goal. 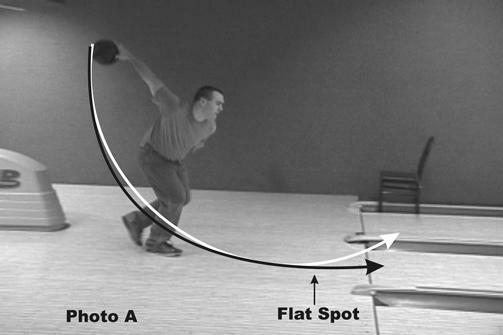 Once you have a good feel for your body position and how low the hand has to be for the ball to sit on the floor, pick the ball up only about four inches, lifting with your slide leg, not your bowling elbow. If you lift the the ball higher off the lane than this slight amount, you will be standing up and out of position. Pull the ball back a little past your slide foot heel and then make the ball land again and see if you can “scoot” the ball on the floor until it is just past your toe. 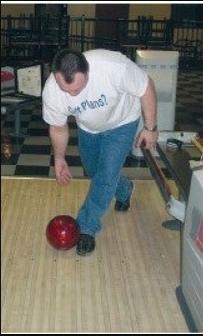 Make sure the ball lands right beside your slide ankle just like it was when it was sitting on the floor. This is demonstrated in photos below. A side note – when we go into full approach speed we won’t actually land the ball on the floor on the wrong side of the foul line, but that’s our goal for now. As our speed increases, the landing spot tends to move forward automatically. 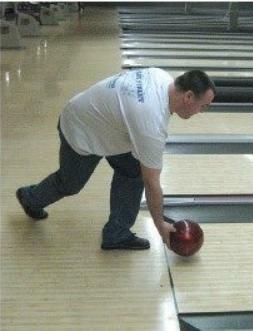 You can stand in front of a friend and gently roll the ball to him/her and he/she will stop it with his/her foot. It’s really helpful, plus it gives you an idea that we want to start off rolling the ball very slowly so you won’t break the person’s foot. RELATED POST: Bạn có kĩ thuật tốt nhưng vẫn bowl chưa hiệu quả? Vì sao? The third step is to move up to the foul line and actually throw some balls down the lane. We are not making an approach yet. We are still in our finishing position making very slow and short swings to scoot the ball onto the lane. #Step 4: Once you think you are used to it, it’s time to get the feet engaged and make some very slow approaches. I suggest the whole time you are making the slow approach, you look directly at the foul line. The idea is to set the ball down on the foul line by putting your body into the proper position and doing the scoot. It can also be helpful if you envision that you are throwing the ball into a pipe that is only slightly larger than the ball. If the ball comes off your hand on an upward trajectory it would crash into the top of the pipe. The best method is to try to get the ball down parallel to the floor as soon as possible. That will give you a nice long flat spot at the bottom of your swing which people usually call it as “post the shot”. 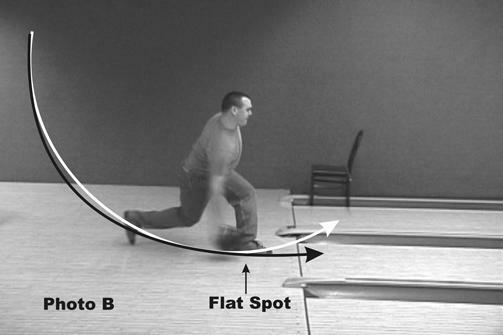 If you used to bowl without sliding or just stop and throw the ball, you definitely won’t be able to land the ball on the lane smoothly. Sliding fundamentally assists bowlers to land the ball onto the land smoothly. Let’s look at this picture to understand how the sliding contributes to the perfection of flat spot. The red dots circle in #1 demonstrates the swing plan without flat spot, consequently creating a hit up on the ball (which is really bad). The orange line at the bottom of the swing demonstrates the flat spot created by the sliding movement of the feet at the foul line. Without sliding, you can not create flat spot. Look at these 2 PWBA bowlers Danielle McEwan and Neu Hui Fen. They created perfect flat spot with sliding at the foul line. ”What about those two pros I see on TV lofting the ball 15 feet down the lane”? Those two pros are Mika Koivuniemi from Finland and Walter Ray Williams Jr. from Florida. I have said in just about every article I have written that there are exceptions to every rule. These two bowlers are exceptions without a doubt. 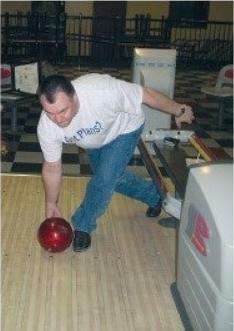 Mika has spent most of his competitive life bowling in countries where the term “lane maintenance” does not translate. The heads on some of these lanes have cracks in them big enough to lose a Volkswagen. These lane conditions rewarded bowlers that could throw the ball hard and straight and Mika certainly does that. Walter Ray Williams Jr. also throws the ball fairly straight most of the time and well deserves his tour nickname: “Dead Eye”. If you throw the ball with very little axis rotation (side spin) like Walter Ray and Mika, then laying the ball down smoothly becomes much less important and having pin point accuracy is a must. Walter Ray, however, does sometimes hook the ball quite a bit when the lane condition demands it and he would do much better if he would learn to lay the ball down smoothly when he has to hook it.